Amie Siegel (American, b. 1974). 'Provenance' (still), 2013. HD video, color, sound; 40 min., 30 sec. 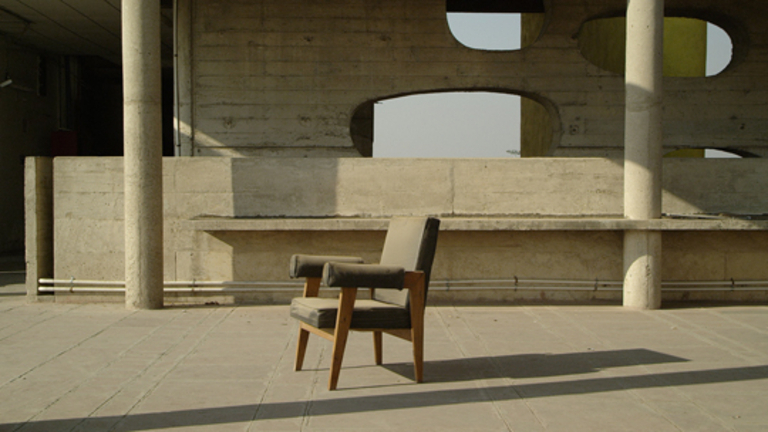 A film work of cinematic scale, Provenance traces in reverse the global trade in furniture from the Indian city of Chandigarh. Conceived in the 1950s by architects Le Corbusier and Pierre Jeanneret, Chandigarh’s controversial modernist architecture includes original pieces of furniture—tables, chairs, settees, desks—created specifically for the building’s interiors. Recently these pieces have appeared at auction houses around the world, commanding record prices. Starting with the Chandigarh furniture in the present, the film begins in New York apartments, London townhouses, Belgian villas and Paris salons of avid collectors. From there, it moves backwards to the furniture’s sale at auction, preview exhibitions, and photography for auction catalogues, to restoration, cargo shipping containers, and Indian ports — ending finally in Chandigarh, a city in a state of entropy. Juxtaposing contemplative tracking shots, precise framing, and recurrent tableaux the film enacts a subtly discursive cinematic space, peeling back time to make visible the furniture’s movement around the globe. This accumulative montage exposes the circuits of ownership and history that influence the furniture’s fluctuating value. Amie Siegel. Ranging from photographs, video, film installations, and feature films for the cinema, American artist Amie Siegel’s work has been exhibited in solo exhibitions including Amie Siegel: Provenance, currently on view at the Metropolitan Museum of Art, New York, as well as solo and group exhibitions at MoMA/PS1, MAXXI Rome, Hayward Gallery, London, Whitney Museum of American Art, Walker Art Center, Kunstmuseum Stuttgart and KW Institute for Contemporary Art, Berlin. Her films have screened at Cannes, Berlin, New York and Toronto Film Festivals, The Museum of Modern Art, New York and The National Gallery of Art, Washington, D.C. She has been a fellow of the DAAD Berliner-Künstlerprogramm, Guggenheim Foundation, and is the recipient of a Sundance Institute Film Fund award. In 2014 Storefront for Art and Architecture commissioned Amie Siegel’s The Architects as part of OfficeUS. For more information about this piece please click here.